The Palace of Governors was originally constructed of adobe with wood beams (vigas) and thatch roofing. In the 17th century, the building served first as a casa real (“royal house”) for the local crown officials of Santa Fe, and then a Pueblo domestic structure. After the Spanish crown reclaimed New Mexico in 1692, the structure once again became a garrison for its officials. The porch running along the front of the building serves as an arcade and covered public space. The flat roof emphasizes the structure’s length, which runs a full city block in Santa Fe. These features were redesigned and refurbished in the 20th century. The Palace of Governors stands directly across from Santa Fe’s main plaza (to the right, not seen in this picture). This site was customary across Spanish America. In Mexico City and Lima, for instance, the Viceregal palaces front onto the main plazas. 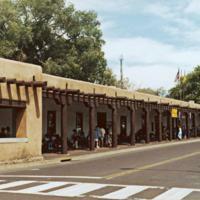 These protruding roof beams of the building, known as vigas, are a common feature of the architecture of Santa Fe. While these particular vigas are modern, the style harkens back to colonial-period buildings. The walls of the Palace of Governors were originally made of adobe and needed regular re-plastering to keep them stable. The arcade was reconstructed in the 20th century in a revival style so that it emulates the look of an older structure. Today, it houses a daily market, with Native Americans selling jewelry, pottery and textiles. As with all casas reales, this one was built at the behest of local officials who represented the Spanish crown. After the Pueblo Revolt, indigenous residents took over the building and re-modeled it—subdividing rooms, covering over doors and windows, and adding ladder-entries through the roof. When the Spaniards retook Santa Fe, the building was again re-constructed. It thus has been refurbished many times across its life. This structure was a fortress within the presidio of Santa Fe. It held barracks and its thick adobe walls offered protection from winter cold as well as enemies. Its builders—some of whom were military men, others Pueblos—adapted technology and materials used by region’s Pueblo inhabitants. In the 17th century, Santa Fe, New Mexico was an outpost of New Spain and a regional ‘capital’ city. 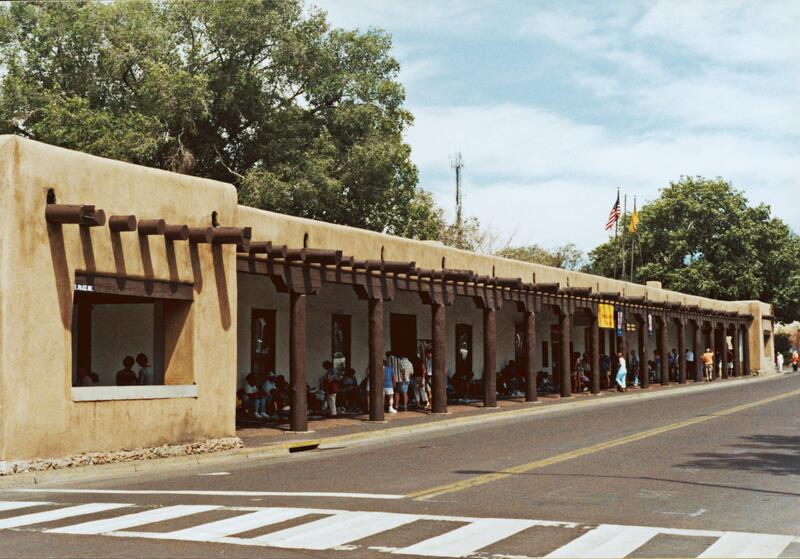 While built to house officials and troops representing the Spanish crown, the structure was taken over by Pueblo peoples after the Pueblo Revolt of 1680. Across the late 17th-early 20th centuries, as Santa Fe became part of Mexico and then the United States, the Palace of Governors housed officials and administrators of both nations. In 1909, the building became a history museum. Today it also holds a library, photographic archive and research facility. The Palace of Governors, like all casas reales, was not merely an administrative building, but also carried symbolic connotations as the seat of Spanish government in the region. Its control was thus imperative for those seeking to demonstrate political authority. And while Santa Fe may have seemed a distant outpost to urban residents of Mexico City and Madrid, the city was tied into the most important trade networks of Spanish America. Excavations have revealed European, Chinese and Mexican imports in the Palace of the Governors as well as local products. This reaffirms that the political centers of Spanish America were at once local constructions but also deeply embedded in larger administrative processes and ambitions. Markovich, Wolfgang, F.E. Preiser, and Fred G. Sturm, eds. 1992. Pueblo Style and Regional Architecture. New York: Van Nostrand Reinhold. Nabokov, Peter and Robert Easton. 1989. Native American Architecture. Oxford: Oxford University Press. Pierce, Donna and Cordelia Snow. 2006. “Hybrid Households: A Cross-section of New Mexican Material Culture.” In Transforming Images: New Mexico Santos In-Between Worlds. C. Farago and D. Pierce, eds. Pp. 101-113. University Park: Pennsylvania State University. Snow, Cordelia. 1974. “A Brief History of the Palace of the Governors and a Preliminary Report on the 1974 Excavation.” El Palacio 80: 1-21.